Two ground stations will track the INTEGRAL satellite whenever it is visible: ESA's Redu in Belgium and NASA's Goldstone in the USA. These two satellite tracking stations establish and maintain communications between the gamma-ray observatory in space and the control centre on the ground. ESA's Mission Operations Centre responsible for satellite control is located at ESOC, the European Space Operations Centre, in Darmstadt, Germany. The INTEGRAL team at ESOC will perform the spacecraft operations and maintenance tasks and it will uplink the observation plan to the satellite in orbit. 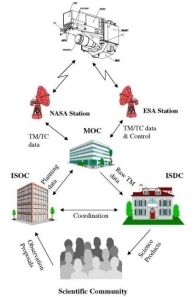 The observation plan has been made by the INTEGRAL Science Operations Centre, ISOC, at Noordwijk, the Netherlands. In October 2000 ISOC issued a first call for observation proposals addressed to the scientific community. This covers so-called guest observer observations for the first year of INTEGRAL operations. A committee selected the submitted proposals on their scientific merit. The accepted proposals are the basis of the General Programme that covers most of the observing time of the INTEGRAL observatory. A remaining fraction of 25-35% has been reserved for scientific institutes participating in the design and development of the INTEGRAL mission. ISOC processes the selected proposals into an optimised plan which consists of a time-line of target pointings and the corresponding instrument configuration. This observation plan will then be forwarded to the Mission Operations Centre in Darmstadt. At ESOC the observation plan is transformed into an operational command sequence which is transmitted to the spacecraft from Redu and Goldstone. The Mission Operations Centre in Darmstadt also gathers the raw science data of INTEGRAL. These data are sent to the INTEGRAL Science Data Centre, ISDC, in Versoix near Geneva, Switzerland. The ISDC processes the raw data taking into account the instrument characteristics and converts them into physical units. Then the data is distributed to the observer and archived for later use by the scientific community. The ISDC will routinely monitor the performance of the instruments and conduct a quick-look science analysis. If an object of special interest is detected, this is reported to the INTEGRAL Science Operations Centre, ESOC, Madrid. There the project scientist will decide if the observing programme has to be rescheduled to study the special object. The Mission Operations Centre in Darmstadt and the INTEGRAL Science Operations Centre in Madrid are under the responsibility of ESA. The scientific community led by Swiss principal investigator Thierry Courvoisier will provide help from the Integral Science Data Centre in Versoix. Participants: Switzerland, Germany, Denmark, France, Italy, Ireland, Poland, and United States.